I joined RE/Max Masters office with a knowledgable background in Education, Administration, Languages and Visual Arts. I have been a resident of West Vancouver for over 20 years. I am fluent in Mandarin and English, with basic understanding of Taiwanese and Cantonese. I am a passionate animal lover, volunteer, and a world traveler. In my spare time, I enjoy yoga, hiking, paddle boarding, and all the wonders that Vancouver has to offer. Whether you're looking to buy or sell property, you've come to the right place.Whether you're a first time home seller/buyer or an experienced investor, I'm committed to guiding you through the buying process. There are many important questions to consider when selling and purchasing a home. It's important to work with an experienced REALTOR® when selling and purchasing your most valuable asset. It takes preparation, organization and professional marketing. By using me as your real estate agent I will guide you through every milestone, from analyzing your needs to closing the sale. Avoid time-consuming and costly mistakes and put my experience to use. By working with me, I will ensure that all your real estate needs are met and will guide you every step of the way. Buying or selling a home can be one of the largest life decisions you will make and by working with me, I can streamline the process and save you time, money and stress.I am your neighbourhood expert. I am focused on providing you with the best results and services in the industry. I listen carefully to understand your real estate goals and work hard to create solutions that make sense for you. Whether you are new to the market or an experienced investor, I have the expertise and resources to offer you step-by-step guidance to help you achieve your real estate goals. As is often said, real estate is about location, location, location. I have extensive knowledge of West Vancouver, North Vancouver, Vancouver and Burnaby areas and can help you find the right home for you or the right buyer for your home. 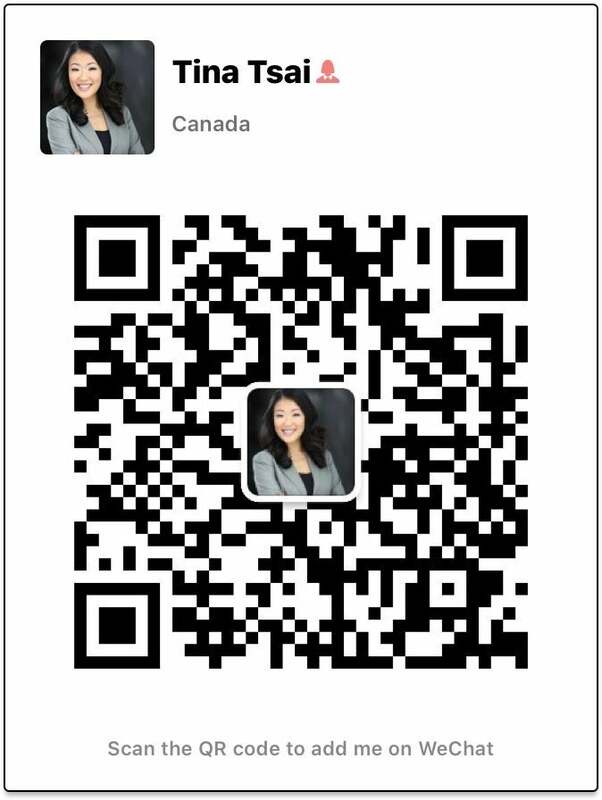 Feel free to contact me at 778-991-9736 or Tina@TinaTsai.ca to find out more about properties for sale, the latest market updates or for real estate advice. 我在西溫居住已經超過20年. 我可以說流利的中文及英文, 對台語及廣東話也有粗浅的了解. 我熱愛動物,樂於助人, 旅遊. 在我閒暇時,做瑜珈,登山,划船及一些新奇事物. 不論您是想置產或出售您的物業,溫哥華是一個很好的市場. 也不論您是首次出售或購置房產,或是您是位有經驗的投資人,經過您的委任我會引導您進入溫哥華房地產的買賣資訊及作業系統. 有很多重要的問題要考量當物業在出售或是購置時刻. 但最重要的是有一位有經驗的地產經紀人, 須要充分的資訊,組織能力及專業市場分析協助您爭取最佳的回報. 讓我成為您的地產經紀人,我會引導您透過每一個資訊去解析您的需求到完成一個買賣案件. 我了解這地區的專業地產經紀人,全心專注提供顧客需及獲得最佳的回報及服務. 我會仔細聆聽並了解您的需求並努力以赴達成您的目標. 不論您是新的或是有經驗的投資人, 我擁有地產專業知識及豐富的資訊來源,協助您一步步達成您的目標. 常聽人說選擇一個好的地點位置最重要,我熟悉西北溫,大溫哥華及伯那比地區,可以協助客戶買賣到心目中的房屋. This page is under development and will be ready in the near future. Please browse the rest of my site and contact me if you have any questions.